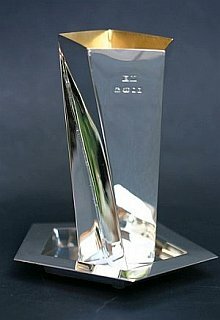 MAS member Eliakikim Mizrahi is a sculptor and Silversmith. He is unable to show any of his work at this year's Annual Exhibition because it is too precious, but as it is so interesting that such a brilliant sculptor is exploring this art form we are reproducing his excellent article on Silversmithing below. You can also download the article as a Word document by clicking here. SILVERSMITHING; As experienced by a novice. At the outset let me explain that this article is written from the perspective of a novice. Silversmithing can be your hobby or your profession, you can do this for the pure enjoyment of creating an object from a flat sheet of silver or you can create objects with the purpose of selling and earning a living. At the start I will try to give the reader a brief historical background on this subject. Silversmithing is the art of shaping and manipulating silver sheet metal into useful objects such as drinking and eating utensils, jewellery, armour, vases and artistic items. Goldsmithing and silversmithing were synonymous to one another in ancient times. It was not until silver became more prominent and acceptable in society that the two occupations were separated. In the ancient Near East the value of silver to gold being less, allowed a silversmith to produce objects and store these as stock. At that time, guilds of silversmiths formed to arbitrate disputes, protect its member's welfare and educate the public regarding the trade. Guilds became popular during medieval times in Europe and England. The goldsmith organized the guild. A silversmith was allowed into the guild, but individuals working with brass or other metals were not. These individuals formed a separate guild for their trade. Members of the guild transmitted their tools and techniques to new generations via the apprentice tradition. Silverworking guilds often maintained consistency and upheld standards at the expense of innovation. Beginning in the 17th century, artisans emigrated to America and experienced fewer restrictions. As a result, silverworking was one of the trades that helped to inaugurate the shift to industrialization in America. During the Middle Ages a separation between goldsmith and silversmith occurred. Silver was plentiful and cheaper than gold. Individuals starting out could not afford gold as their working medium. The goldsmith became more highly revered and was often the banker for the community. The silversmith took the training and skills of goldsmithing into a new trade market. Studying or apprenticing for either profession is most generally done with the metal designated by the trade title. A silversmith will work with other metals such as copper, bronze, nickel-silver and brass. The goldsmith prefers only to work with gold. Currently there is an overlap and a confluence of trades, both goldsmiths and silversmiths work with either metal. This is particularly so with jewellers. The oldest known piece of tooled or silversmithed silver that has been discovered is: The Silver Scrolls that date to 600 B.C. The Silver Scrolls consist of two small sheets of silver that were rolled into scrolls and found in a burial cave in Jerusalem. The text of the "Priestly Benediction" was found inscribed on the surface of the silver. The vocabulary of the modern day silversmith has been handed down through history. Words used throughout history include: annealing, engraving, planishing, polishing, raising, repousse or repoussage, chasing, sinking and soldering. Annealing heats the metal to allow for altering its shape. Engraving cuts shallow designs into the metal. Planishing is using a highly polished hammer to refine the metal surface. Polishing uses abrasive compounds to make the surface smooth and shiny. Raising is the process of shaping a hollow form in the metal. Repousse or repoussage is imprinting a design from the back into the surface of the metal. Chasing is placing indentations into a repousse design from the front of object. Sinking is hammering the metal to create a concave hemispherical shape. Soldering is used to connect the pieces of silver metal using solder which melts at a lower temperature than the silver object. Many of the tools used in ancient times are still used by modern silversmiths. Ancient tools that have been modernized for the silversmith include tongs, hammer, anvil, engraving burins, small mallets, large scales, weights, ceramic furnace, and blow pipe with clay nozzle. Techniques used to join the silver together include welding, soldering and brazing. Documentation proves that soldering has been used since the 4th dynasty. Flux was used to prevent oxidation of the metal surfaces thus allowing the solder to flow and adhere to the metal surface. The flux was made from either lees of wine or natron. The solder was either a soft or hard solder based on the temperature at which the solder melts. The soft solder was made from tin. The hard solder was made from a combination of gold, silver and copper. Current situation in London for the aspiring student or hobbyist. To get some idea of the creative scope and the quality and beauty of finished products I highly recommend a visit to the Goldsmiths' Hall, Foster Lane, London EC2V 6BN. Tel No: 020 7606 7010. There are conducted tours of the magnificent interior of this building and the following fair is a must see event. Clearly all these institutions do have web sites where a wealth of information is available. From my perspective, as someone who wanted to do silversmithing as a hobby, the first step was to find somewhere to learn. It is not practical to teach yourself, you need a workshop with a variety of tools and you need someone to teach you. You will need to learn about the properties of the metal, how to handle the silver, how to form shapes, how to cut, how to file, how to solder and a host of other techniques to which I have not as yet been exposed. You must appreciate that the master craftsman silversmith has had many years of training and experience. So, as a hobbyist, where do you go to learn, unfortunately, there are not many places and they are not all that easy to access. You can go on the internet and you will find many centres teaching silver jewellery but very few teach silversmithing. Fortunately for me I was directed to West Dene College near Chichester. (Check their website) This college runs a variety of courses including a course on silversmithing. I attended a weekend course under the excellent tutorship of Mr John Norgate and I started on my first piece, a silver box. This is considered as a good starting point as it teaches you a variety of basic techniques. I believe Central Saint Martins College London, also run silversmithing courses. Once you have created your first piece, the question then arises, where do you go from here? Unlike drawing or painting, unless you have a fully equipped workshop, you cannot do this type of work at home. Even if you have the facility at home, you still need a teacher and this is not easy to find. Once you have done the basic course, you will begin to know who to speak to for information on continuing courses and the availability of other facilities. There is a workshop centre in Abingdon near Oxford, the Jewellery and Silver Society Oxford (JASSO), they have a very well equipped workshop and you can work under the supervision of excellent teachers. Silversmithing is very much a hands on technique, you must be prepared to use your hands and get dirty, be prepared to use hammers, metal files and don't be afraid to use a blowtorch, heating the silver and soldering together various components is very much part of the technique. What are you going to create and where do you get your inspiration from? Clearly, in the beginning you will be limited and guided by your instructor, but as you become more proficient and you appreciate the scope and limitations of the metal you are working with, as with any other form of art, you will get inspiration from your own imagination, and all the other art forms that lend themselves to three dimensional creation. Where do you get the materials and tools? There are a number of suppliers, undoubtedly, your instructor will guide you and tell you where and what to buy. Cooksongold London and HS Walsh and Sons London are two merchants that come to mind, they are both situated in Hatton Gardens, London, and they also have web sites. Costs, tools can be expensive, you need to shop around and don't forget that the workshop where you choose to work will usually have many of the tools you need. The price of silver sheet or wire will be dependent on the daily bullion price of the metal which. for silver on the 2nd June 2015 stands at £10.94/ounce. Members of the Medical Arts Society will appreciate that these prices will be higher than paper, paint or clay but on the other hand, silver pieces take time to make, artists will produce many paintings in relation to the time it takes to make one silver box or goblet. As you start completing different pieces, you will need to become familiar with the Hall Marking of silver. To learn more about Hall Marking you should visit The London Assay Office at Goldsmiths' Hall, Gutter Lane EC2V 8AQ. Tel No 020 7606 8971. The Goldsmiths' Company Assay Office is where hallmarking began; they have been testing and hallmarking precious metals for over 700 years. They conduct frequent tours which are very informative and the guide will answer all your questions. It is extremely satisfying to know that once you have your own Hall Mark on your piece, when someone picks it up in a couple of hundred years' time, they can look at the Hall Mark, check with the London Assay office and identify you as the maker, exactly what grade and finesse silver your piece is made from, which office assayed and marked your piece and what year it was made. As I mentioned at the start, I am very much a novice so what I have written for the members of MAS is only a small introduction to a large subject; I hope this will go some way to whet your appetite. As evidence of what I have managed to produce so far I have attached photographs of three pieces, a silver box, a traditional wine goblet and a more modern designed wine goblet.